The Pebble Time is a great smartwatch, if not the best. It has lots of great features and has the best battery life for a smartwatch at the moment. Although the Pebble Time is already great on its own, TYLT found a way to make a great smartwatch even better. 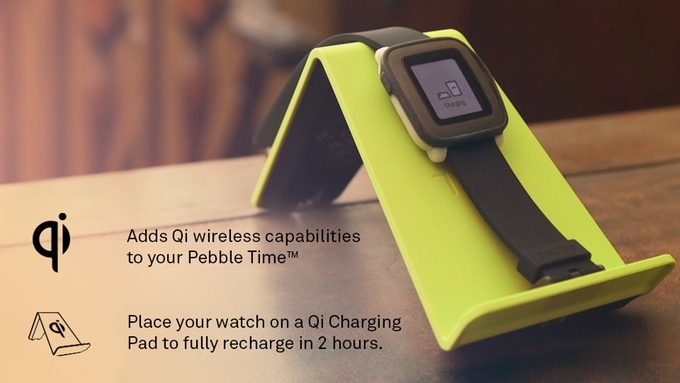 TYLT, mainly known for their wireless charging products, went to Kickstarter to fund their VÜ Pulse which adds a heart rate monitor and Qi wireless charging to your Pebble Time. Charging the TYLT VÜ Pulse using Qi wireless charging takes approximately 2 hours for completion. The TYLT VÜ Pulse also acts as a protective case for the Pebble Time. The heart rate monitor has two modes, first is the passive mode which will measure your heart rate every 30 minutes. The second is the active mode which reads your heart rate every 10 seconds, made for when you’re on a workout. All the heart rate information is saved on to the Pebble Health app which could be exported to Apple Health or Google Fit. Currently, TYLT has already surpassed their $100,000 goal on Kickstarter with around 20 more days to spare. If you want to send a pledge to have your own VÜ Pulse, head on over to their Kickstarter Campaign and check out their offers. The cheapest offer is at $44 which gives you your own TYLT VÜ Pulse.